In most lists of the best telecommuting cities, the focus is on local technology and the quality of Internet access. But as high-speed broadband and wireless options become more ubiquitous, and with freelancing making traditional workers less profitable, the needs of telecommuters are shifting. For remote workers, it's hard to justify paying a premium to live in an expensive city like New York or Los Angeles, especially when many of the country's second cities offer first-rate values. Our list of the best cities for telecommuters looks at places that provide a big-city experience at a small-town price. To produce it, we started with a list of all of America's metropolitan areas with more than one million people, then narrowed it down by eliminating any city whose cost of living was above average. For the next step, we considered the lifestyle needs of telecommuters. Many studies have shown that remote workers tend to be more educated than the average employee, so we factored in The Daily Beast's 2010 study of America's smartest cities, which looks at educational attainment, number of universities and libraries, and general intellectual environment. We also used Central Connecticut State University's study of the country's most literate cities, which measures book sales, libraries, newspaper sales, and online reading activities. Finally, because working from home can wreak havoc on one's personal fitness, we factored in the healthiest cities, as determined by the American College of Sports Medicine's American Fitness Index. Unfortunately, two of our choices were recently ranked among the top 10 most dangerous cities in America, based on FBI crime statistics. For some, this may dim the attraction of St. Louis and Cleveland. Then again, it's worth remembering that every city has its good and bad neighborhoods, and that bustling metropolises can sometimes be tough metropolises. Our list is low on marquee names, but big on everything else. Whether your priority is for sports teams or live music, mountains or beaches, warm weather or cold, there's something for you here. All of our cities meet the basic needs of a sophisticated urbanite, from ballets and orchestras to operas and museums, but they come with bargain price tags. Home of the Milwaukee Brewers baseball team, "Brew City" is famous for its contribution to America's beer scene, a fact that is hardly surprising given its rich German and Eastern European heritage. Although much of the beer business has moved away, the city still remembers its heritage with festivals and beer gardens, including a proposed civic beer garden in Marquette Park. It's also home to 13 Fortune 500 companies, 17 colleges and universities, and two botanical gardens. And, for sports fans who prefer basketball to baseball, it also is the home of the NBA's Milwaukee Bucks. For most people, Nashville probably conjures up images of Dolly Parton, Robert Altman movies and the Grand Ole Opry. Yet, while the city remains the center of country music, it has a lot to offer people who don't know Porter Wagoner from Minnie Pearl. Home to Vanderbilt University and more than 20 other colleges and universities, it has sometimes been called "the Athens of the South." In keeping with that theme, it also boasts a full-scale copy of the Parthenon located in the heart of Centennial Park -- one of 99 parks in the area. And, for sports fans, the city has both an NHL and an NFL team. 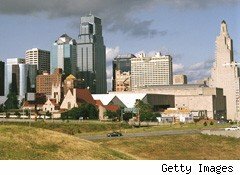 Straddling the border of Missouri and Kansas, the KC metro area is home to more than 2 million people. 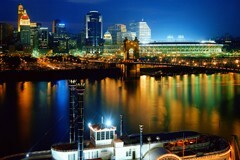 It has major league baseball and football teams, and is home to three Fortune 500 companies. One of the birthplaces of jazz, Kansas City still has a lively music scene that encompasses jazz, rock and rap. And, as far as education is concerned, it is home to more than a dozen colleges and universities. 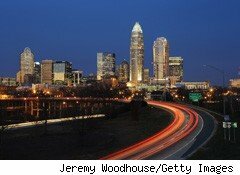 In the midst of 2008's Wall Street crisis, Charlotte came into the national spotlight as the home of Bank of America. 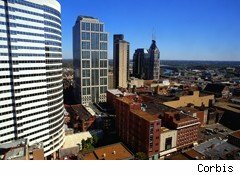 In fact, "The Queen City" is America's second-largest banking metropolis, right after New York, and is home to nine Fortune 500 companies. It's nineteen colleges and universities include UNC Charlotte and a campus of Wake Forest University. For sports fans, it has major league football, basketball and hockey teams, while art lovers can enjoy its 17 museums, including the Bechtler Museum of Modern Art and the Mint Museum of Art. Perhaps most impressive, Charlotte is the cheapest city on this list, with a cost of living that is more than 10% below the national average. 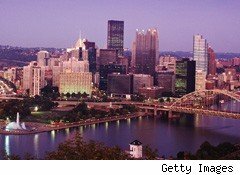 Once known as "Steel City," Pittsburgh has more recently been given the title "Paris of Appalachia," a shift that reflects its transition from a center of steel production to a more diverse economy. 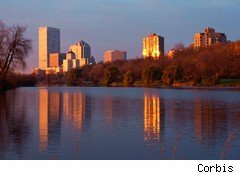 The city, the 22nd largest in the U.S., has expanded into a wide range of other industries, including robotics, nuclear engineering and finance, and is currently home to eight Fortune 500 companies. It is also an education center, with seven universities, including Carnegie Mellon. For sports fans, it has major league football, baseball and hockey teams. 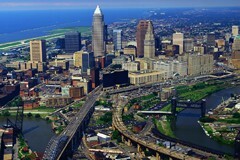 Cleveland has had a tough couple of decades: Beset by pollution, second-rate sports teams and financial misery, it was branded with the brutal title "the Mistake on the Lake." While it has been slowly recovering, 2010 was hard on the city, as it reeled from the loss of basketball player LeBron James and the death of hometown underground icon Harvey Pekar. Yet Cleveland is nothing if not resilient, and its rich history and numerous cultural attractions combine to make it a great option for people in search of a full-service big city at a small city price. Home to one of America's "big five" top symphonies, a popular orchestra, the Rock and Roll Hall of Fame, and two major art museums, it also has major league baseball, football, basketball and hockey teams. 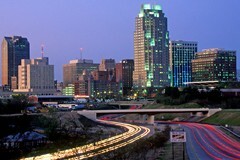 Often forgotten in the shadow of Charlotte, North Carolina's capital is its second-biggest city, and the heart of the state's "Research Triangle" of NC State, UNC Chapel Hill and Duke Universities. With six other colleges and universities in the city, it is both a cultural and a business center, and is ranked as Daily Beast's fourth-smartest city in America, the highest-ranking city on our list. And while it doesn't have as many sports franchises as Charlotte, its hockey team, the Hurricanes, won the Stanley Cup in 2006, making them the only major league North Carolina team ever to win a national championship. 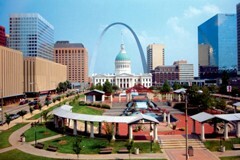 Once the fourth-largest city in the U.S., St. Louis is now No. 52, a victim of job losses, industrial outsourcing and other woes. Still, it has a robust economy: Home to eight Fortune 500 companies, it is also heavily invested in education, with more than 20 colleges and universities. It boasts a rich musical heritage and a continuing reputation for great music, and has more than 80 theater and dance groups. For sports fans, it has major league baseball, football and hockey teams. 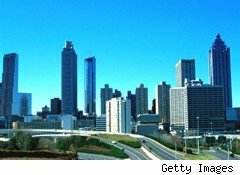 Anybody who has watched Atlanta over the past few decades should be unsurprised at its emergence as one of America's most energetic cities. Home to four major league sports teams, several top universities, and an impressive array of cultural offerings, it gives residents the full city experience. What's particularly impressive, however, is that Atlanta combines all of this with a cost of living that's 4% below the average for a big city in America, and a crime rate that has fallen sharply over the past decade. Ohio's largest metropolitan statistical area has all the standard accoutrements of a major city: With a ballet and a symphony, an opera and several museums, it is home to more than 10 colleges and universities, and is headquarters to nine Fortune 500 companies. But its real claim to fame is culinary: Host of America's largest Oktoberfest celebration, Cincinnati's rich German heritage continues to flavor the city's culture. In recent years, however, schnitzel and bratwurst have given way to spicier fare, and Cincinnati's famous five-way chili has propelled it to the title of "chili capital of the world," with more chili restaurants per capita than any other city in the world. Yet, even with all those beans, Cincinnati remains the second most fit, third most literary and second cheapest city on this list. Austin's fame is as eclectic as the city itself. The real star of Richard Linklater's breakout film Slacker, it has a rich intellectual and cultural scene, due in no small part to the University of Texas -- Austin, the flagship of the UT system and the undisputed leader among the more than 10 colleges and universities that make their home in the city. Austin is especially famous for its impressive music scene, which has made it the self-declared "live music capital of the world." As far as fitness is concerned, the American College of Sports Medicine ranks it as America's tenth-healthiest city (and the top one on this list).